Or, if you are Jewish, Happy Passover. And, speaking of Passover, there are some believers in Christ who actually do Passover. After all, Christ is our “Passover Lamb” so to speak. And while most believers on Christ call it Easter, I prefer Resurrection Day since it is the day Christ was resurrected, that is, came back to life as seen by Apostles, Disciples and others. Easter or Resurrection Day follows Good Friday, where Christ died in the crucifixion (as would the Passover Lamb die as the sacrifice for sin), and then Holy Saturday, where Christ “descends into Hell” as the Apostles Creed states in order to liberate good souls who did not have the opportunity to claim Christ as Savior but did God’s will anyway (such as the prophets, John the Baptist, and others). But instead of a Passover sacrifice which would have to be replicated year after year, this Sacrifice was for all sin, for all sinners, for all time. If you are not a believer on Christ, please consider that act as an option for you. 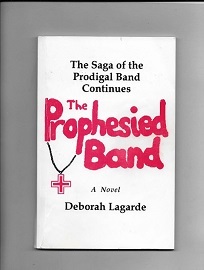 Author deborahlagardePosted on September 7, 2018 September 7, 2018 Categories Novel Creation, OmegaBooks, The Prodigal Band FREE PDF e-book, The Prodigal Band Trilogy, UncategorizedTags creative writing, divine intervention, Master Disc Creation, Rock music history, Spiritual fiction, The Prodigal Band FREE PDF e-book, The Prodigal Band TrilogyLeave a comment on The Reality of Why I Wrote My Books–I Had To. In the fall of 1993, at night with the myriad of star-shine visions outside the house at night in the mountains, a view of the heavens, thinking some divine entity was hovering above, a thought came into my head, in my own voice, telling me that now was the time to begin to compile all the character and theme and setting and story and all the stuff I had carried in my head since the mid-60s. The time to write the novel was nigh…. BOOKSTORE Is Set To Go! 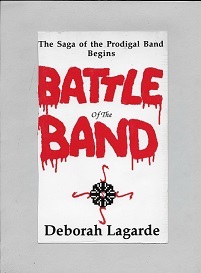 I just added a Book Store link so one can purchase one of the printed Prodigal Band Trilogy novels, Battle of the Band or The Prophesied Band, or BOTH! When you purchase BOTH in the same order you save $5.00 on the cost of the books as well as saving on shipping costs! To purchase either or both books at once, click here! Author deborahlagardePosted on May 14, 2018 Categories Purchase Books!, The Prodigal Band Trilogy, UncategorizedTags Book Store, The Prodigal Band TrilogyLeave a comment on BOOKSTORE Is Set To Go!